Microsoft’s release of the XBox game console in 2003 was pushed in the UK with “Mosquito”, a television commercial celebrating the value of purpose and play in a short life. The Mosquito ad was developed at Bartle Bogle Hegarty (BBH London) by creative director John Hegarty, creatives Farid Mokart and Fred Raillard, and agency producer Andy Gulliman. with were the minds behind the concepts of the ‘ages of man’ and mosquito ads. Filming was shot by director Daniel Kleinman, at the time working with production company Spectre, London, with producer Johnnie Frankel, director of photography Ivan Bird, and set designer John Bramble. Kleinman later merged Spectre with Stark Films to form a new company, Large, before forming his own company, Kleinman Productions. He’s now working with other directors at Rattling Stick. Editor was Steve Gandolfi at Cut & Run, London. Post Production was done at Framestore, London, with a team led by post producer Helen MacKenzie and post coordinator Rebecca Barbour, animation effects supervisor William Bartlett and colorist Dave Ludlam, VFX artist Jake Mengers and Andrew Daffy. Believe it or not, not a single living mosquito was used in the Xbox commercial. 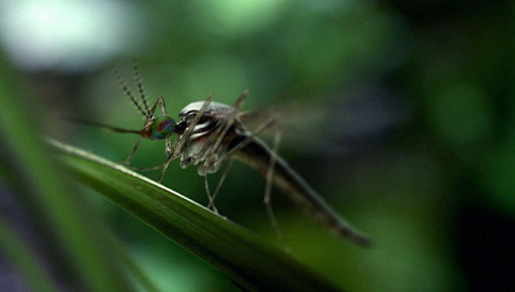 Digital mosquitoes were developed with 3D software Maya 4.0, with seven levels of detail depending on how close the shot was. Automatic tracking software, 2d3’s ‘Boujou’, sped up the completion of shots such as the camera move up the arm of a hospital patient (with a production line of mosquitoes at work along the defenseless limb. Animals and birds, which were supplied as stock footage, were all placed on composited backgrounds in Discreet’s software Inferno. Sound was produced by Johnnie Burn at Wave Studios, London. Music, “Am I wrong?”, is by French DJ Etienne de Crecy.